The Food and Drug Administration (FDA) is publishing a final rule prohibiting certain nutrient content claims for foods that contain the omega-3 fatty acids docosahexaenoic acid (DHA), eicosapentaenoic acid (EPA) and alpha-linolenic acid (ALA). This rule finalizes a proposed rule the agency published in 2007 without any substantive changes. The final rule prohibits statements on the labels of food products, including dietary supplements, that claim the products are "high in" DHA or EPA, and synonyms such as “rich in” and “excellent source of.” The final rule similarly prohibits some such claims for ALA. The final rule takes no action with respect to other such claims for ALA. Under the Federal Food, Drug & Cosmetic Act (the Act), nutrient content claims such as “high in” are allowed only for nutrients for which a reference level to which the claim refers has been set. FDA can set such nutrient levels by regulation, or in some situations, if the requirements of the Act have been met, such nutrient levels can be based on authoritative statements published by certain types of scientific bodies, such as the Institute of Medicine of the National Academies (IOM). FDA has not established nutrient levels that can serve as the basis for nutrient content claims for DHA, EPA, or ALA. In 2004 and 2005, FDA received notifications asserting that the IOM had issued authoritative statements that identified such nutrient levels for DHA, EPA, and ALA. There were multiple notifications that identified multiple, sometimes conflicting nutrient levels for these three omega-3 fatty acids. With respect to all of the nutrient content claims for DHA and EPA that were identified in the notifications, FDA has determined that none of these claims meets the requirements of the Act. The final rule therefore prohibits all of these claims. With respect to the two sets of nutrient content claims for ALA that were identified in the notifications (which differed in that each set identified a different nutrient level), FDA determined that one of these sets of claims did not meet the requirements of the Act. The final rule therefore prohibits that set of claims. FDA is taking no regulatory action at this time with respect to the other set of nutrient content claims for ALA, which will therefore be allowed to remain on the market. The final rule is on display today at the Federal Register website and will officially publish April 28. If adopted by regulators, guidance the Organization for Economic Cooperation and Development (OECD) recently issued on characterizing oleochemicals could result in US chemical manufacturers needing to obtain new names and identification numbers for chemicals they have made for decades, according to a regulatory affairs official from the American Cleaning Institute. OECD's guidance on characterizing oleochemicals melds various long-standing chemical identification systems used by regulators in different countries and regions and could introduce confusion in global commerce, according to the institute. It could result in the same chemical having multiple names and identifications in different parts of the world, Kathleen Stanton, director of technical and regulatory affairs at the American Cleaning Institute, told Bloomberg BNA April 17. Oleochemicals are among a group of chemicals classified as derived from “unknown or variable compositions, complex reaction products and biological materials,” or UVCBs. These chemicals cannot be represented by unique structures and molecular formulas, according to EPA guidance. Chemicals in this group are derived from tallow, lard, sunflower and other fats and oils as well as petroleum. They are used in many industrial, consumer and medical products, including wire insulation, coolants, lubricants, soaps, detergents and personal care products. The OECD Task Force on Hazard Assessment published its guidance April 11 detailing an approach to describing and naming oleochemical substances. OECD's guidance would necessitate new names and possibly new Chemical Abstract Service (CAS) numbers for many of these chemicals, Stanton said. Chemical manufacturers then would have to submit chemicals that they have made for decades for review to regulatory authorities as if the chemicals were new compounds, she said. Trade disruption and marketplace confusion could result if a chemical, long known by one name and CAS number, had to be sold under a new name and number, she said. Stanton said she doubted whether countries and regions with long-standing inventories, such as Canada, the European Union and the United States, would adopt the OECD's guidance. The approach might be used by a country forming a new chemical inventory, she said. She urged chemical manufacturers to continue to track nomenclature issues addressing other types of UVCBs that will be considered by OECD's task force. The OECD task force undertook the oleochemicals guidance as a pilot, Stanton said. The next groups of UVCBs the international organization will examine are renewable fuels and hydrocarbon solvents, she said. The EPA used several approaches to identifying UVCBs when it developed its inventory of chemicals made and sold in the United States in the late 1970s and early 1980s as required by the Toxic Substances Control Act. Among the approaches used was a system the EPA developed with the American Cleaning Institute—then known as the Soap and Detergent Association or SDA. The EPA said in the 1985 version of its TSCA inventory that, although the system had limits, the SDA substance names were “as precisely descriptive of the chemical composition of a substance as possible.” The agency's UVCB guidance requires chemicals be identified as precisely as possible. The EPA guidance on oleochemicals is available at http://www.epa.gov/oppt/newchems/pubs/uvcb.txt. “OECD Guidance for Characterizing Oleochemical Substances for Assessment Purposes” is available at http://bit.ly/P2OZfH. The 1985 TSCA inventory is available at http://op.bna.com/env.nsf/r?Open=prio-9jds2s. Reproduced with permission from Daily Environment Report, 77 DEN 1 (April 22, 2014). Going to San Antonio? Check out the Delegate Resources (password provided with your registration confirmation). ♦ Decide what sessions or presentations to attend, and create your own schedule by using the itinerary builder. *In a responsible effort to encourage sustainability, all abstracts will be provided in electronic format only. 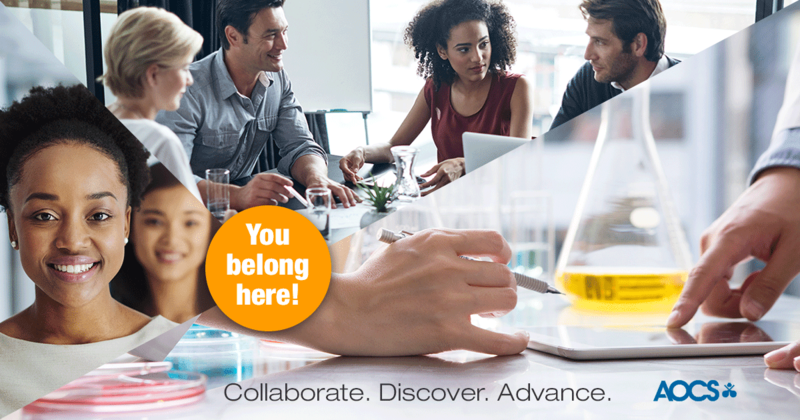 Connect with the brightest minds from around the globe and use our expanded career network to search for the perfect employee or career. Utilize our Career Fair on Monday, May 5. Reserve a table to meet with interested candidates, free of charge. Tables must be reserved by April 25. Display printed job openings in the AOCS Career Center. Free of charge for meeting attendees, and $35 per listing for those not attending. Display your resume or CV at the AOCS Career Center free of charge. Bring several copies with you to display in the supplied bins. You do not need to sign up to use this service. To reserve a table, submit a job posting, or for further details on the Career Center, please contact Doreen Berning. We are developing topics that will highlight the issues that matter the most to those in your area of expertise. These topics will be featured on inform|connect. We would love to include your expertise, thoughts and comments. To participate just click here to share. 1. What one thing should your industry accomplish in 2014? 2. Tell us about a problem or challenge that keeps you up at night. inform|connect wants to give you the chance to both ask questions of your peers and inspire their innovative thinking. A wide range of products, including foods, nutraceuticals, personal and home care products, industrial lubricants, oilfield chemicals, and biofuels involve stable mixtures of liquids that ordinarily do not mix together. This first free article from the April issue of Inform explains the basic science of emulsions and how they are used in a variety of applications. Industrial hemp is one step closer to returning to US farms. An amendment in the final US farm bill relaxed the longstanding restriction on the farming of industrial hemp for research purposes. This second free article considers the implications. Don't forget to check your AOCS Member page regularly to view new postings from Chemical Watch. Simply log in to your membership account to access the news stories. AOCS is looking for industry collaboration on methodology that would detect the approximate concentration of carotenoids present in food and nonfood grade crude corn oil. If you are interested, please contact Gina Clapper. Online registration is open until April 18. Make your hotel reservation today! Due to several events taking place in San Antonio this May, hotels are reaching capacity quickly. --> Register Now—best rate offered through May 31. The organizing committee welcomes you to submit an abstract. The symposium will focus on contaminants in fats and oils, oil quality and remediation, value-added minor components of cereals and oils, and oils from new crops. The technical program will feature invited presentations by leading experts, as well as volunteer oral and poster presentations. For abstract submission guidelines contact meetings@aocs.org. Submission deadline is June 1, 2014. World-class experts will present papers on various lecithin sources, production and applications in the University Conference Building, Ghent University. Demonstrations of lecithin emulsion characterization and applications will be organized in the university laboratories. 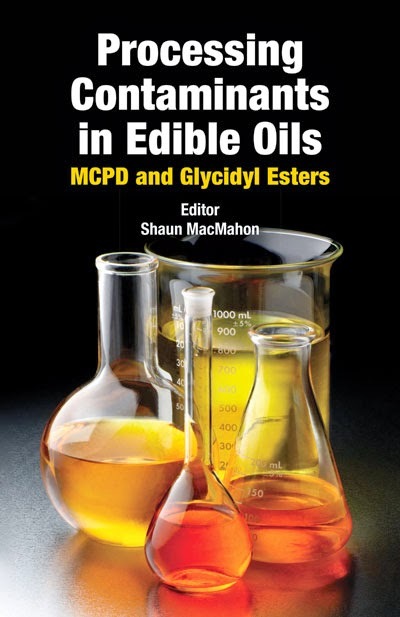 AOCS Press is proud to introduce its’ newest title, Processing Contaminants in Edible Oils: MCPD and Glycidyl Esters. This 230-page book sums up the current research regarding the potentially harmful contaminants formed during deodorization, and covers everything from mechanisms of formation, to precursor molecules, to mitigation to the analytical strategies for accurate detection and quantification. Shaun MacMahon, US Food and Drug Administration, brought together experts from around the globe to contribute. Learn more about this topic and join in the discussion at the Tuesday morning, May 6, 2014, Analytical Session that is part of the AOCS Annual Meeting in San Antonio. Today (April 11, 2014), the Google Doodle honors what would have been the 115th birthday of chemist Percy Julian. Julian is most known for synthesizing hormones from soybean oil and creating a synthetic substitute for cortisone. In June 2008 Inform featured Percy Julian in the article "Giants of the Past: Percy Lavon Julian (1899–1975)" by Jim Kenar. "Percy Lavon Julian was born April 11,1899, in Montgomery, Alabama, USA,to James Sumner Julian and his wife,Elizabeth Lena Adams. Percy was the oldest of six children and the grandson of a former slave. His father, James,was a federally employed railway mail clerk and, as such, their family was better off than most blacks of the day. Although, Julian had little formal school training, since limited public education was available for blacks at the time, he had a burning desire, encouraged by his family, to pursue higher education." A new full-day Animal Protein Seminar will be offered for the first time this year at the 9th annual Oilseed & Grain Trade Summit (Summit), which will be held October 7-9 at the Hyatt Regency in New Orleans, La. This pre-conference seminar is fashioned after the popular Spring Livestock, Meat, Poultry and Dairy Conference previously organized by Informa Economics, and will provide attendees with an outlook, delivered by industry experts, for the cattle, hog, dairy, poultry, and egg sectors. The seminar will be offered on Tuesday, October 7 and is open to all registrants of the Oilseed & Grain Trade Summit. Space in the seminar is limited, and registration will be on a first-come, first-served basis. This new animal protein outlook event was born out of a recently established alliance between HighQuest Partners, host of the Oilseed & Grain Trade Summit, and Informa Economics that has Informa rolling their Spring Livestock and Fall Outlook conferences into the Summit. As a result, the Summit, which annually convenes buyers, sellers, and global players in the oilseed, protein meal, vegetable oils and feed grains sector, will feature richer content and more diverse networking opportunities. Senior commodity analysts from Informa and others will be on hand at the Animal Protein Seminar and Oilseed & Grain Trade Summit to provide their expertise and strategies for addressing the opportunities and challenges facing the livestock, poultry, oilseed, and grain sectors in the coming year. Particular focus will be placed on the impact that shifting global demand and higher price expectations will have on the livestock-derived product markets in late 2014 and beyond. Beyond key sessions on the global outlook for the cattle, hog, dairy, poultry and egg sectors, the seminar will provide critical insights into trends in the global downstream meat market and the implications of government policies on the animal protein production sector. The Oilseed & Grain Trade Summit is the largest annual industry event of its kind. Attendees have the opportunity to share the latest information on trends and developments in the oilseed and feed grains markets while networking with their peers, and establishing relationships with new suppliers and clients in order to enhance their competitive edge. Attendees hail from around the world – the 2013 event in Minneapolis, Minn., included over 75 exhibitors and hosted nearly 650 attendees from more than 30 U.S. states and 25 countries. To view the full agenda and speaker and registration information, visit www.oilseedandgrain.com. The U.S. Food and Drug Administration (FDA) is issuing a final rule that affirms the interim final rule’s change to its regulations on record-keeping to be consistent with the expansion of FDA’s access to records as required by the FDA Food Safety Modernization Act (FSMA). The final rule adopts, without change, the interim final rule issued February 23, 2012. The amendments to the Federal Food, Drug, and Cosmetic Act made by FSMA allow FDA access to records beyond those relating to specific suspect food articles if the agency reasonably believes that other food articles are likely to be affected in a similar manner. In addition, the FSMA amendments permit FDA to access records relating to articles of food for which there is a reasonable probability that the use of, or exposure to, the article of food will cause serious adverse health consequences or death to humans or animals. FDA's records access and the record-keeping requirements were first established by amendments to the FD&C Act made by the Public Health Security and Bioterrorism Preparedness and Response Act of 2002. The expanded records-access authority is designed to improve FDA’s ability to respond to and contain safety problems with the food supply for humans and animals. FDA is also making available a guidance document “FDA Records Access Authority under Sections 414 and 704 of the Federal Food, Drug, & Cosmetic Act,” which updates with minor changes the draft guidance issued on February 23, 2012. Comments on the guidance are being accepted. FDA also is making available a guidance document “Why You Need to Know About Establishment, Maintenance, and Availability of Records—Small Entity Compliance Guide,” which updates the small entity compliance guide issued in December 2004. Comments on the small entity compliance guide are being accepted. The International Peanut Genome Initiative releases the first peanut genome sequences to the public. Alexandria, VA – The International Peanut Genome Initiative (IPGI) — a multinational group of crop geneticists working in cooperation for several years — has successfully sequenced the genome of the peanut. The new peanut genome sequence will be available to researchers and plant breeders across the globe to aid in the breeding of more productive, more resilient peanut varieties. Peanut (Arachis hypogaea), also called groundnut, is an important crop both commercially and nutritionally. Globally, farmers tend about 24 million hectares of peanut each year, producing about 40 million metric tons. While the oil and protein rich legume is seen as a cash crop in the developed world, it remains an important sustenance crop in developing nations. Scott Jackson, director of the University of Georgia (UGA) Institute of Plant Breeding, Genetics and Genomics at the College of Agricultural and Environmental Sciences, serves as chair of the International Peanut Genome Initiative. The effort to sequence the genome of the peanut has been underway for several years. According to plant geneticist, Peggy Ozias-Akins, UGA-Tifton, GA, while peanuts have been successfully bred for intensive cultivation, relatively little was known about the legume’s genetic structure because of its complexity. The peanut grown in fields today is the result of a natural cross between two wild species, Arachis duranensis and Arachis ipaensis that occurred in the north of Argentina between 4,000 and 6,000 years ago. Because its ancestors were two different species, today’s peanut is a tetraploid, meaning the species carries two separate genomes which are designated A and B sub-genomes. To map the peanut’s genome structure, IPGI researchers sequenced the two ancestral parents, because together they represent the cultivated peanut. The sequences provide researchers access to 96 percent of all peanut genes in their genomic context, providing the molecular map needed to more quickly breed drought-resistant, disease-resistant, lower-input and higher-yielding varieties. The two ancestor wild species were collected from nature decades ago. One of the ancestral species, A. duranensis, is widespread but the other, A. ipaensis, has only ever been collected from one location, and indeed may now be extinct in the wild. When grappling with the thorny problem of how to understand peanut’s complex genome, it was clear that the genomes of the two ancestor species would provide excellent models for the genome of the cultivated peanut: A. duranenis serving as a model for the A sub-genome of the cultivated peanut and A. ipaensis serving as a model for the B sub-genome. Fortunately because of the long-sighted efforts of germplasm collection and conservation, both species were available for study and use by the IPGI. Knowing the genome sequences of the two parent species will allow researchers to recognize the cultivated peanut’s genomic structure by differentiating between the two subgenomes present in this crop. Being able to see the two separate structural elements will also aid future gene marker development — the determination of links between a gene’s presence and a physical characteristic of the plant. Understanding the structure of the peanut’s genome will lay the groundwork for new varieties with traits like added disease resistance and drought tolerance. University of California, Davis genome researchers Lutz Froenicke and Richard Michelmore are optimistic that these genome sequences will serve as a guide for the assembly of the cultivated peanut genome that will help to decipher genomic changes that led to peanut domestication, which was marked by increases in seed size and plant growth habit. The genome sequence assemblies and additional information are available at http://peanutbase.org/files/genomes/. The International Peanut Genome Initiative brings together scientists from the United States, China, Brazil, India and Israel to delineate peanut genome sequences, characterize the genetic and phenotypic variation in cultivated and wild peanuts and develop genomic tools for peanut breeding. The initial sequencing was carried out by the BGI, Shenzen, China. Assembly was done at BGI, USDA-ARS, Ames, IA, and UC Davis, Davis, CA. The project was made possible by funding provided by the peanut industry through the Peanut Foundation, by MARS Inc., and three Chinese Academies (Henan Academy of Agricultural Sciences, Chinese Academy of Agricultural Sciences, Shandong Academy of Sciences). A complete list of the institutions involved with the project and the other funding sources is available at www.peanutbioscience.com. In the U.S. peanuts are a major row crop throughout the South and Southeast. While they are an economic driver for the U.S. economy, the legume is also crucial to the diets and livelihood of millions of small farmers in Asia and Africa, many of whom are women. Apart from being a rich source of oil (44–55 percent), protein (20–50 percent) and carbohydrates (10–20 percent), peanut seeds are an important nutritional source for niacin, folate, calcium, phosphorus, magnesium, zinc, iron, riboflavin, thiamine and vitamin E.